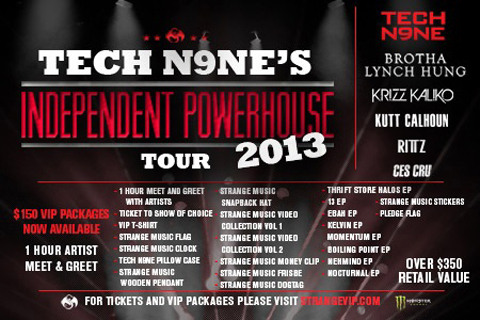 VIP UPDATE – VIP Packages To Ship 2/15/13! To all of the fans who have purchased or are planning on purchasing a VIP package for the upcoming Independent Powerhouse Tour: we wanted to let you know that we plan on beginning to ship out packages on February 15th. We will make every effort to get them in your hands as quickly as possible and appreciate your support of Strange Music and the Independent Powerhouse Tour. Thank you and we look forward to seeing you on the road! CLICK HERE TO PURCHASE YOUR VIP PACKAGE TODAY!